Spanish Skype offers the possibility for non- native Spanish teachers to invite a native Spanish teacher to their classroom. Learn more about your teacher! What are our online Spanish lessons like? See our FAQ. 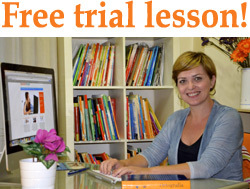 Ask for offers, free trial lesson or more info here. Would you like to do listening exercises with a native speaker? Would you like to study a specific topic with Spanish Skype? Grammar explanation and practice, vocabulary, cultural subjects… anything that you want to teach with a native professional teacher. I prepare and teach the lesson for you. Would you like to converse with a native speaker? You can count on Spanish Skype for all of these activities.